The story of Morgan the orca has captured the world with a sense of dismay and injustice. Despite a viable release plan put forward by over 30 experts, a Judge in the Netherlands ruled that Morgan should go to Loro Parque, a theme park in Tenerife, Spain. Within the pages of this website you will find details that will shock you, disgust you and frustrate you. This is Morgan’s Story. In 2010 a young female orca was spotted swimming alone in the waters of the Netherlands. Although emaciated (extremely under weight), was never stranded, but was free-swimming when she was captured by a local theme park (Dolfinarium Harderwijk), under a Dutch Government issued ‘rescue, rehabilitation and release’ permit. Unfortunately, the theme park never fulfilled the ‘rehabilitation and release’ part of the permit. Rather, the young orca, whom they called Morgan, was trained institutionalized behaviours, as well as undignified tricks. They kept her in a tank that was barely large enough for her to exhibit normal body postures, for 18 months. Fearing the worst, a group of Dutch NGO’s (non-Governmental organizations) banded together in 2010 and formed the Orca Coalition. Working with experts from around the world, they took the Dutch Government (who issued the permit) and the theme park who violated the permit, to court. Unfortunately, for Morgan, the Dolfinarium Harderwijk and Dutch Government officials were responsible for ensuring Morgan’s rights as a wild-born res publicae dependent of the Kingdom of the Netherlands. As such, they failed to present all of the relevant material facts necessary to guide the Court and ensure transparency of the acts and actions of all the parties involved. This resulted in a distorted presentation of the issues to the Court. However, the Court also failed to acknowledge crucial evidence, deliberately dismissed new findings by orca experts, overlooked aspects of the law and stripped Morgan of her legal rights. The end verdict, a travesty of justice, resulted in Morgan being shipped to another theme park (Loro Parque), in the Tenerife Islands, Spain. We have not given up on Morgan – she continues to suffer in captivity and therefore we will continue to expose the scandal of what has happened. This website, provides a timeline of events, it has video and photographs to illustrate the horrific conditions that Morgan has to suffer and the indignity that she is exposed on a regular basis, having to perform tricks for food. Morgan being trained to do a trick called the ‘alien’ where the animal has to shake their head, flop out their tongue and rise high out of the water, all that the same time. Such a trick has no educational value, no husbandry value and no research value. It is typical of the type of tricks trained at Loro Parque. Taken 02 July 2012. Importantly, it also provides the evidence we have collected and as such is a historic record of Morgan’s story. It allows members of the public, to see for themselves, how justice failed her. It shows that greed, not Morgan’s welfare, were the driving forces behind what has happened and how she is still treated, often kept locked in a tank even smaller than the one she was in whilst held captive in the Netherlands. This chronicle, perhaps the best documented case of ‘whale laundering’ ever exposed, is complicated and intricate. But that is partly how the industry has managed to get this far. Within Morgan’s website we have not only provided the evidence we presented in the various hearings of the Court cases, but where we could source it, the evidence produced by the ‘other side’. Additionally, since Morgan was moved (November 2011) we have spent the intervening years conducting intense investigations into how we could help her. We have consulted with experts in all four countries involved. We have looked into how Morgan, an orca born in Norway was then captured off the Dutch Coast and how even though she is currently held captive in Spain she is now claimed to be owned by SeaWorld Entertainment, Inc., a USA based company. Through the theme of inter-connected companies we have exposed the ‘laundering’ of Morgan. Our research has cumulated in a ‘White Paper’ (released November 2015) which graphically outlines the aspects of Morgan’s situation that the Courts failed to address. It also illustrates how Loro Parque is attempting to violate Morgan’s CITES EG (transport) Certificate. This white paper is dedicated as the cornerstone for “Morgan’s Law”, a call on the international community to adopt a uniform set of laws and regulations to ensure that nothing like the series of events in Morgan’s case ever happen again. Unfortunately, during our research we have found that Morgan isn’t the only cetacean (whale, dolphin or porpoise) who has been exploited in this way. We have identified 13 facilities who have laundered cetaceans through ‘rescues’ – so that they could be kept for commercial use. In effect these animals (at least 13 different species, involving many individuals), which needed help, have instead been exploited and have become ‘salvaged assets’. We therefore hope that the data presented here on Morgan’s website will help not only her, but other cetaceans in similar situations. Rescued cetaceans should be just that – rescued and treated with the compassion and dignity that they deserve. The Free Morgan Foundation was formed to get Morgan back to her family in Norway. 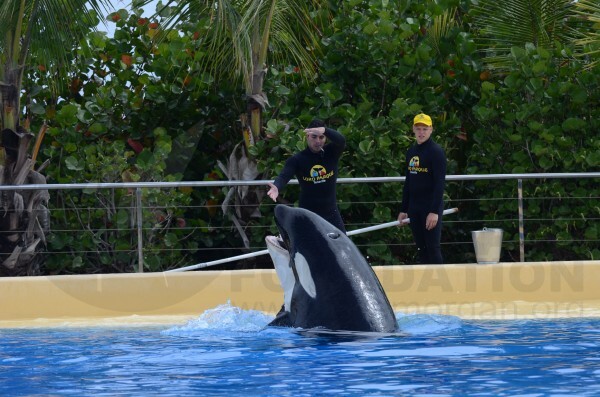 Now she has been transported to another ‘abusement’ park, this one in Spain, called Loro Parque. There, she is bullied, attacked and harassed. She has to perform in shows and the adult male tries to mate with her, when she is still a pre-teen.